A number of UN MONUSCO peacekeepers from Ukraine have been detained by authorities in Goma, North Kivu after they had been found with uniforms of the Congolese army, FARDC, and Republican (Presidential) Guard in their luggage. There are more than ten Ukrainian peacekeepers stationed at Goma airport as military pilots and it has been reported that liaison had been made with a member of the Congolese Republican Guard in order for a transaction to be made. Several sources have stated that such dealings had long been suspected and on this occasion the network behind the trafficking had now been dismantled, the individuals involved being arrested and taken to the army’s 34th military region for further questioning. Given the extraordinary events that unfolded on this day, Wednesday 26th November, a timeline of events that followed has been included below. 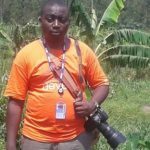 Information then began to emerge following a long period of silence stating that the Ukrainian peacekeepers, via their Congolese military interpreter, offered $5,000 to a member of the Republican Guard. On arrest it was first stated that the package of outfits purchased were rations of bread, or for use in hunting when returning to Ukraine, but would be investigated by the military. It was not long before UN MONUSCO forces arrived in the office of Brigadier General Emmanuel Lombe Bangwangu, military spokesman Lt Col Felix Prosper Basse joining General Dos Santos Cruz in proceedings. 3:45pm Goma – Six pairs of uniforms had been discovered, all with guns. In all twelve people with guns have been held and identified. 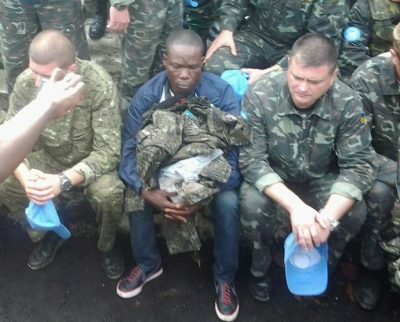 Ukrainian agents with their Congolese accomplices had a small parcel which revealed that the ‘trafficking’ may not be an isolated incident due perhaps to earlier indiscretions.